Complementing the striking beauty of Tenerife, comes a gorgeous hotel that offers great comfort, superior service and a host of family-friendly activities. The Clubhotel Riu Buena Vista is the ideal holiday home for travellers looking for glorious sunshine, adventurous hikes into the wilderness, a rich colonial legacy and glamourous nightlife. Located within the famous Playa Paraiso resort community, the hotel is just 30 km from the Tenerife South Airport. Guests can enjoy all-inclusive services in one of the 500 stunningly decorated rooms and 5 bungalows of the hotel. Other highlights of the hotel include a Jacuzzi, a large swimming pool, a play area for kids and a clubhouse. The buffet restaurant at the Clubhotel Riu Buena Vista serves authentic Spanish cuisine and even hosts live cooking shows, which can help you to pick up a skill or two. 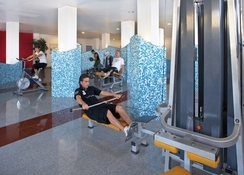 The hotel also provides facilities for water sports and other activities. 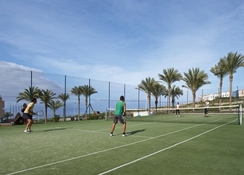 Play a spirited game of volleyball on the beach or catch up on your daily workout at the fitness centre of the hotel. Gastronomes can pamper their taste buds at the in-house restaurant serving international, Canarian and Italian cuisines. At Clubhotel Riu Buena Vista, holidays will never have a dull moment. 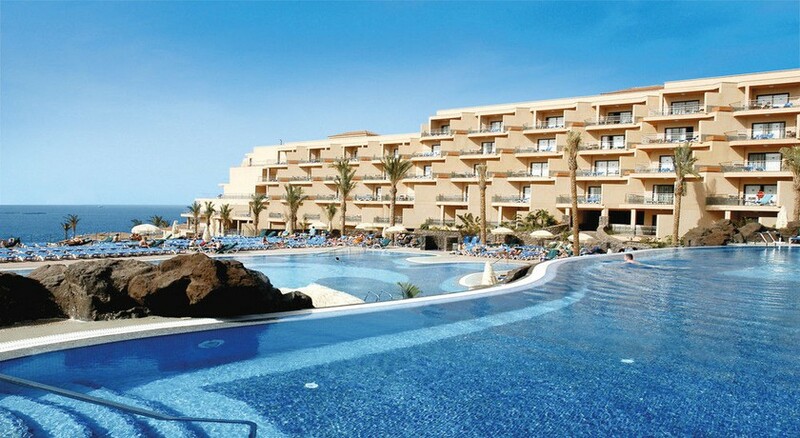 The Clubhotel Riu Buena Vista is around 30 km away from the Tenerife South Airport. Being situated in the resort community of the area, there are a number of nightclubs and restaurants in this area. Check out El Taller Tapas Bar and Montauk Steakhouse, both of which are just a few blocks away from the hotel. For those looking for a quiet beach, there is Playa Ajabo, which is great place for sun-seekers and romantic couples looking for solitude. The rooms of Clubhotel Riu Buena Vista offer panoramic views of the sea and the surrounding areas of the hotel. They exude a warm Mediterranean vibe and feature contemporary furniture and smart amenities. The rooms are equipped with air conditioning, telephone, hair dryer, safe, mini fridge and satellite television. For larger families, the villa suites are perfect. Housed in independent buildings, they feature spacious rooms with en-suite bathrooms, hydro-massage bathtubs and Jacuzzis. Some of the rooms and suites come with astounding views of the sea. The menu of Clubhotel Riu Buena Vista is especially designed to offer the best of Spanish cuisine. 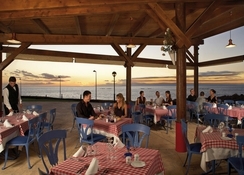 The restaurants also serve international, Canarian and Italian cuisine. For lip-smacking snacks and aperitifs, the three bars located in the main building and the pools area are your best options. A typical day at the Clubhotel Riu Buena Vista is full of fun activities and wholesome family entertainment. Relax under the Tuscan sun, at the expansive swimming pool of the hotel or discover your creative side at the Riu Art workshop. Indulge in your favourite sport with RiuFit or get to know the island better with tours and day excursions organised by the hotel. Visit the Teide National Park or Barranco del Inferno Nature Reserve for close encounter with the interesting flora and fauna of the island, or delve deep into the local culture of the island by visiting some of the picturesque fishing villages near the hotel. Find your beautiful self at the hotel’s salon or burn those excess calories at the well-equipped fitness centre. The beautiful beach is just 500 metres from the hotel. It is the perfect spot for lounging and soaking up the summer sun, with the kids safely restricted to the limits of the RiuLand kids’ club.